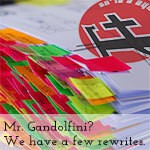 The F Plus | Mr. Gandolfini? We Have A Few Rewrites. The F Plus has spent a number of years exploring odd areas of the internet in order to present you with material you might find thought provoking, interesting, horrifying, or otherwise upsetting to your worldview. Sometimes. We sometimes do that. Other times we find crappy fanfiction and read it derisively. This week, The F Plus has forgotten what The F Plus did with all the prounouns The F Plus had.